Some people just want to have the steam from the shower, while others build in a real steam generator. A Steam Shower can't really be closed off to prevent the steam from escaping into the bathroom without providing a vent for the steam to escape. If you are installing a steam generator you must provide a way to vent the steam. Without a vent the steam will push open the door and escape into the bathroom. This gallery shows a few examples of Euro Shower installations. Pricing for these units is determined by the glass square footage, the fabrication required, and hardware selection. With your space measurements we can manufacture you a shower door kit similar to any unit shown in these galleries. To select the correct shower layout for your application use the Style Layout page to select the correct Quote / Order form. 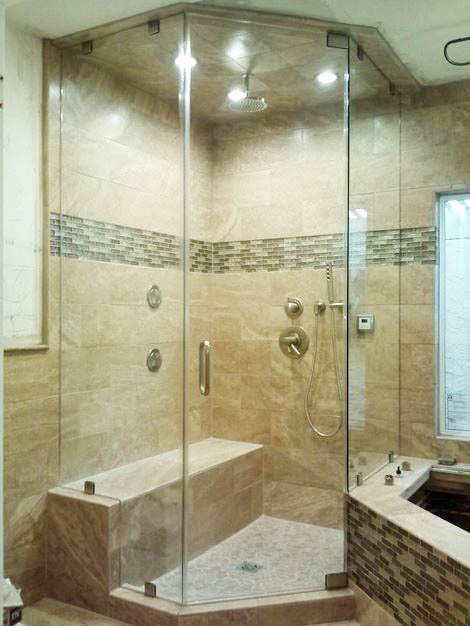 Visit the Fabrication Options page for additional ideas of how to make your shower special. Wall mounted hinge left door with movable transom, notched right inline, aquarium corner with a right return panel up on the tub deck. Wall mounted hinge right door, notched left inline, aquarium corner with a left return panel up on the tub deck. Left wall hinged door with a right fixed panel. Door will swing in or out of the shower. 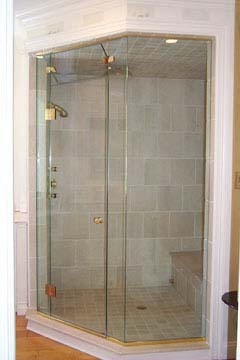 This shower door is hinged on the Right wall using the heavy duty Vienna Style hinges. The left inline is notched.Glass is to the ceiling making this a steam shower. Poor ventilation - door will need to be left open into the shower. The door is centered between two side panels which are attached to two neo-angle panels. The door is hinged off the left fixed panel. Movable transom for ventilation. Style N2F Neo Steam door. Hinge right door with side inlines and fixed transom. Clear 1/2" Tempered glass. Door and left inline are on the left side. The center and right panel form a 45 degree aquarium corner and are full height. This unit will have a ventilation problem. Style N2 full height door hinge right with pivot hinges. Left panel is notched and the right panel is up on the deck. Door will need to be left ajar to dry out shower.